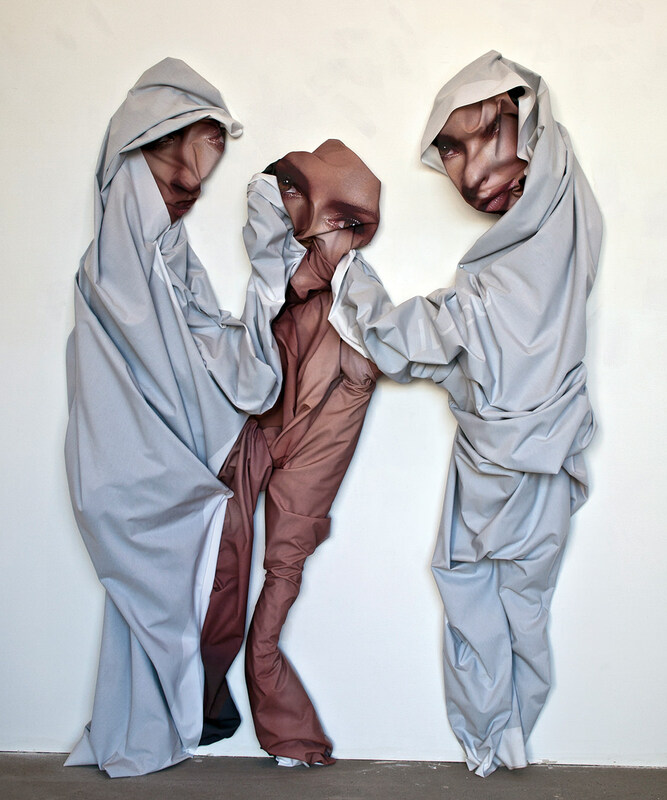 Holy Wrapte, 2010, installation at Brooklyn’s Four 11 Gallery. 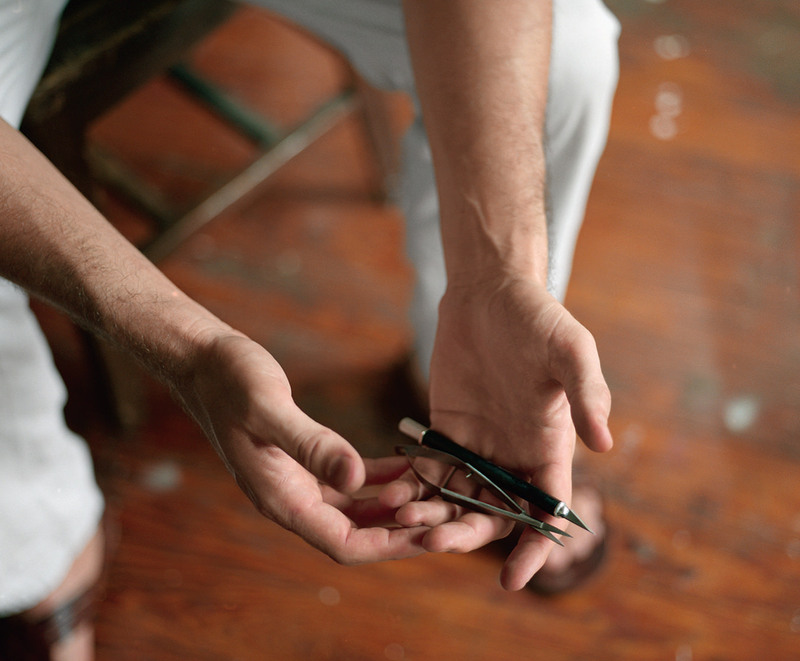 Inside the artist’s studio in Williamsburg, Brooklyn. It’s a scorching, humid New York summer day, but Julien Gardair, clad in khaki shorts and a long-sleeved T-shirt, is unfazed by the heat. To be polite, he flicks on the air conditioning. French people don’t use much A/C, explains the Versailles-born contemporary artist, pouring glasses of sparkling water thick with crushed limes. It’s Sunday afternoon, and Gardair is hanging out in his Brooklyn studio, nestled in the most Italian section of Williamsburg. The versatile artist has been in New York for three years, and shares the loft with his photographer roommate, a fellow French expat. In true New York custom, both guys live and work in the industrial space, which is located near an authentic pasta factory. (“During the recession, they gave me stuff for free. It was nice,” he says.) On the kitchen wall resides their third roommate, an oversized, cartoonish bonhomme made from a piece of black tape. After two years, the tape is starting to wilt slightly. 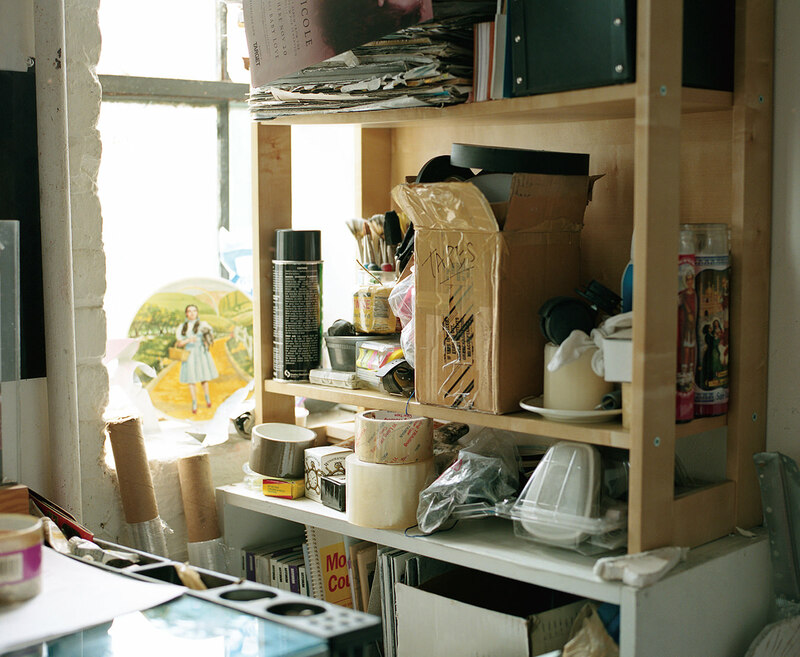 Gardair’s studio is small and neat, packed with remnants of art and life, shelves jammed with paint cans and walls lined with paintings. Stacks of portfolios and magazines are piled here and there; fashion magazines are one of Gardair’s materials of choice. 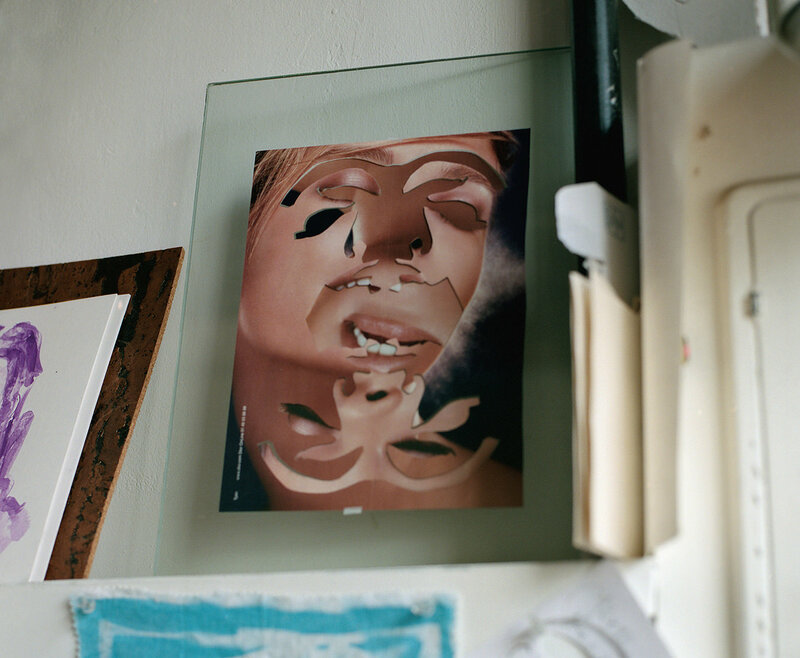 Into their pages he cuts beautifully intricate graphic designs and patterns that are actually reversible, so when the magazine image is flipped, it becomes something else entirely. Working at home is no big deal for Gardair; he clearly possesses the self-discipline required for a fruitful freelance life. Besides, with such varied media—including not only paint, canvas, and magazines, but stamp prints, video, linoleum, carpet, cork, felt, acrylic, printed fabric, and tape—he’s often out in the field creating site-specific, immersive installations. New York in particular has welcomed his installation work into chic public spaces like restaurants and boutiques. His Jungle Fever installation at Jérôme Dreyfuss in SoHo—which ran until the end of August—was made from a single 18-metre piece of extended bicolour felt. 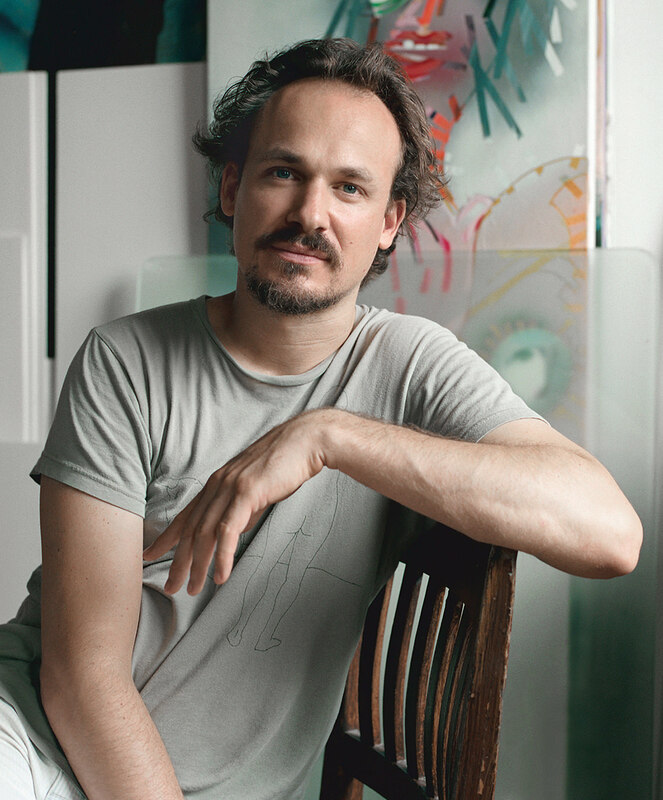 “I keep the integrity of the fabric,” says Gardair, who also has a decorative panel mural permanently on display at Manhattan’s Veritas restaurant, and at the Shelborne Hotel in South Beach, Miami (both projects are collaborations with Crème design and Jun Aizaki). Gardair’s also working on a new video piece with the American painter Brooke David for New York’s Big Screen Plaza. A consistent thread connects Gardair’s work: the artist’s desire to grow, challenge himself and, by doing so, steer himself, bit by bit, toward that ever-elusive notion of freedom. 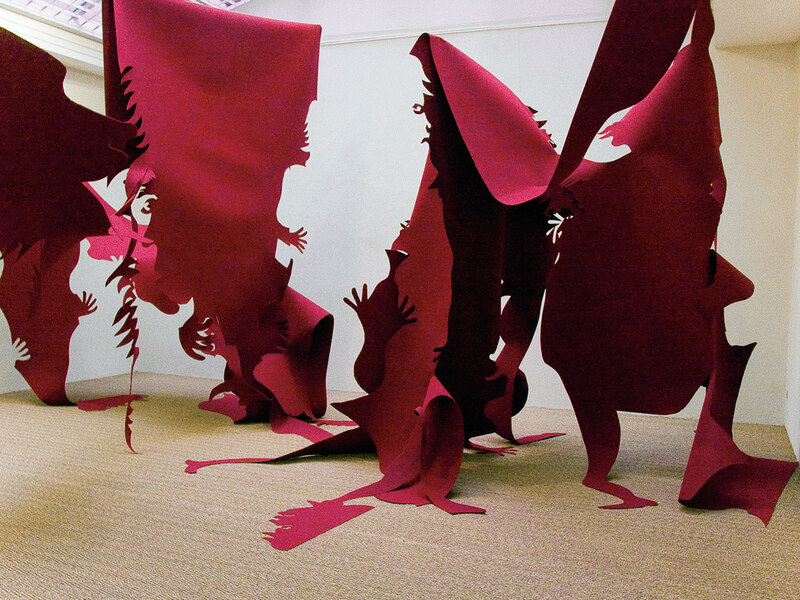 Despite so much variety—from cartoon figure outlines made from ultra-long stretches of black tape to giant linoleum cut-outs suspended in doorways—a consistent thread connects Gardair’s work: the artist’s desire to grow, challenge himself and, by doing so, steer himself, bit by bit, toward that ever-elusive notion of freedom. Gardair was raised in France by his mother, a homemaker, and his father, a director of human resources, and Gardair is the eldest of five siblings. By the time he was 11 years old, the family had moved four times, before settling in the south of France between Montpellier and Sète, 15 kilometres from the sea. He moved to Paris to study at the École Nationale Supérieure d’Arts de Cergy-Pontoise (a 30-minute train ride from the City of Lights). He lived there for 12 years, working as an artist and showing in various galleries and spaces throughout France. Video installations are among these new ideas. This fall, Gardair is developing a series of anticipated video installations, also titled Camera Locus, in Europe. These immersive installations are follow-ups to the very popular Camera Locus 2, La chevelure, which showed at Brooklyn art space Invisible Dog. A recent theme in his art is a social one. Creating installations in public environments is by definition a social experience. A recent theme in his art is a social one. He explains that although it’s not literally visible in the work itself, nor is it part of some covert agenda, creating installations in public environments is by definition a social experience. You can’t work in a cave to make this kind of stuff, you have to engage with people. So last year, to make the monumental Greenouille, the largest cut-out installation of them all, Gardair recruited two assistants to help him climb precarious scaffolding and hang the massive piece 10 metres high. “It’s one roll of carpet, cut in and extended all over the space,” he says of the piece, which showed at La Graineterie art centre in the city of Houilles (also close to Paris).